Origins: Is it Soccer or Football? Although most of the United States has not quite caught on to this trend, the rest of the world loves soccer. Soccer, or football as it’s referred to most commonly across the globe, is the number one sport in nearly every country. It’s an arguable fact: People on this planet love soccer. No matter where you’re from or whether you call it soccer, football or futbol, the game is one and the same. Take a look at the history of this globally celebrated cultural pastime. Although its exact origin is unknown, Romans, Greeks, Chinese, and Native Americans can stake a claim to the creation of the sport. One author even credits Cain and Abel, citing the biblical reference of two brothers kicking an apple around the Garden of Eden (Book of Football 1905). Of course, the Greeks and Romans both like to take credit for the sport through their own historical ball games, Episkyros and Haprastum, respectively. 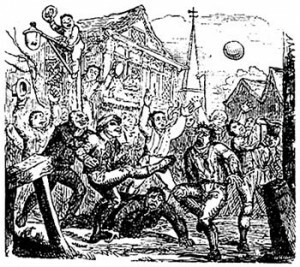 Some wilder theories suggest that the first game of soccer commenced when people would use the decapitated heads of war opponents as the ball. Although there is no solid evidence to prove it, perhaps a few more seasons of Game of Thrones will reveal the truth. Even though it’s the most popular sport around the globe today and outrageously popular throughout Europe, not every Brit has always harbored an affinity for the game. Many British monarchs have tried banning the sport with little success, including King Edward I, who couldn’t stand the passionate ruckus in the town square, King Edward III, King Henry IV, King Henry VIII, and Queen Elizabeth I, who threatened to throw the soccer-playing scoundrels in jail for a week. Refusing to go down without a fight, the zealous law-offenders eventually won the ongoing battle of the bans; kicking (literally) and screaming their way back to the game’s official reinstatement in 1681. Way back in the 9th Century, English residents used pig bladders as a ball. The game advanced exponentially when strips of leather were added to the make-shift mess to make the balls more durable. The first leather soccer balls were all white, and it wasn’t until fans reported difficulty seeing the balls on their black and white television sets that they were altered. Soccer balls developed their traditional black and white checkered pattern in 1970 to combat this issue. The pattern caught on because everyday athletes wanted to compete with the same equipment the professionals were using on TV. It wasn’t until the 16th century that the sport began taking its modern form. During this time, however, hand use was allowed, contradictory to one of the most distinguishing aspects of the game as it’s currently played. By 1863 the official rules were established and the first official soccer match commenced. As the sport took off, governing bodies emerged to facilitate more organized play. The International Federation of Association Football (FIFA), formed in 1904, held the first World Cup in Uruguay in 1930. The World Cup, the single-most-watched sporting event in the world, is held every four years in various countries across the globe. More popular than even the Olympics, more fans worldwide watch soccer than American football, baseball and basketball combined. The longstanding debate: Football or Soccer? It’s a heated debate among sports fans, cross-culturally. To set the record straight for the ‘futbol’ elitists of the world, it’s important to note that the term ‘soccer’ served as precedent for nearly twenty years. When the game developed in England, many different sports were called football. Since ‘rugby football’ already existed, trailblazers of this new game called it ‘association football’ to distinguish between the two. The name soon transformed into Assoccer, and later, to just soccer. As the sport caught on with lower social classes, the name football gained popularity, soon emerging as the sole designation in most countries of the world. Not surprisingly, as with units of measure and the driving side of the road, the United States refused conformity. And because American Football had already claimed the title, the name of the game remained the same – simply, (contrary to its lengthy and complicated history) soccer.